Light Tool Supply: #PRO 3600 digital protractor Lowest on Internet!!!! 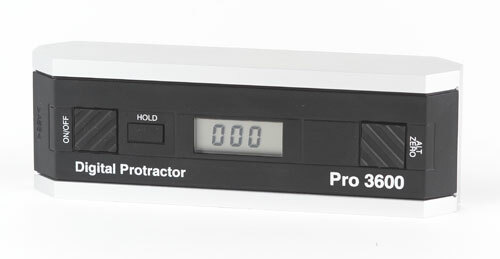 #PRO 3600 digital protractor Lowest on Internet!!!! The PRO 360 Digital Protractor $179.99 is a revolutionary measuring tool that provides an immediate, digital reading of all angles in a 360° range. The unit utilizes a patented, liquid-filled sensor combined with precision measurement circuitry to provide unparalleled accuracy and stability. Full 360 degree range (90° x 4). The PRO 3600 Digital Protractor $316.93 is a revolutionary measuring tool that provides an immediate, digital reading of all angles in a 360? range. The unit utilizes a patented, liquid-filled sensor combined with precision measurement circuitry to provide unparalleled accuracy and stability. Additional information about interfacing to the PRO 3600 Digital Protractor is available in Application Note AN-202: Interfacing to a PRO 3600 Digital Protractor (see link below).